Here are links to two Christmas crafts. One of them I have made; the other I hope to make soon along with my children. These are a delightful Christmas craft that makes wonderful Christmas gifts. I made a number of these several years ago and gave them away. At least one of them is still being used. Hopefully I will be making some of these with my children this year. They may be used as Christmas gifts for teachers and friends. Happy crafting for a merry Christmas! Christmas customs enjoyed in Russia have evolved in three phases. These phases are Russia before Communism, Communist Russia, and Russia after the fall of Communism. Old Russia Christmas was a religious time before the Communists took over Russia. The Russian Orthodox Church held services every day during the twelve days of Christmas. Nearly everyone in the town and surrounding countryside attended the local church making the services standing room only. Many people followed a form of Advent. For thirty-nine days before Christmas they would abstain from eating certain foods like meat. No food was eaten on Christmas Eve until the first star was seen in the sky. Many a Christmas Eve found the children of the house peering out the window watching for that first star so the Christmas Eve feast could begin. The Christmas Eve feast comprised of a twelve-course meal. Fish was a staple of the meal instead of meat which they still abstained from eating. The soup course most likely was borscht, a soup made with cabbage, onions, potatoes, beets, and carrots. Two other popular dishes were kutyala, a rich, sweet porridge made of wheat berries, poppy seeds, and honey, and kissel, a mousse-like berry dessert. Meat could be eaten on Christmas day. Duck, ham, goose, pig, and other roast meats were the centerpiece of the Christmas dinner. Other dishes included borscht, jellied sturgeon, blini (light buckwheat pancakes rolled with caviar and served with sour cream), pelmeni (mini-dumplings filled with beef and pork), and piroshke (savory, filled pastries). Christmas trees were popular in the 1800s. They were procured three days before Christmas and decorated with apples, tangerines, dolls made of dried fruit and candy, walnuts wrapped in gold foil, wooden ornaments, paper lanterns, and topped by a shining star. Instead of Santa Claus, Grandfather Frost delivered toys door-to-door. He did not go down chimneys. He wore a red coat trimmed with white fur and had a long, snow-white, bushy beard. Some children opened the gifts they received from Grandfather Frost on Christmas Eve; others waited until Christmas morning. Communist Russia When the Communists came into power, Christmas was replaced with a Festival of Winter. They also changed from the Julian calendar to the Gregorian calendar. The Russian Orthodox Church, however, continued to use the Julian calendar. The churches that were allowed by the Communist Party to stay open held Christmas services on January 6 and 7, the date of Christmas using the Julian calendar. Churches would be decorated with Christmas trees, icons of saints, and colored lights. Congregations would sing Christmas hymns, but elsewhere there was no Christmas. Many Christmas traditions were transferred to New Year’s, and Grandfather Frost arrived on New Year’s Day. Christmas trees were banned by the Communists; but because the people wanted to keep the tradition, Joseph Stalin, in 1935, lifted the ban calling them New Year’s trees. Many people put up their New Year’s trees on December 31 and left them up until January 13, Old New Year’s Eve). The trees were decorated with toys, little dolls, colored lights, garlands, and topped with the red star of the Soviets instead of the star of the Magi. Grandfather Frost remained the gift giver, but he arrived on New Year’s Eve instead of Christmas or Christmas Eve. Instead of a red robe he wore a blue one. Instead of some of the more fun and frivolous gifts Grandfather Frost brought more practical gifts like clothing, shoes, and books though small toys did appear on occasion. Grandfather Frost was also joined by Snegurochka, the Snow Maiden. The Snow Maiden also dressed in a blue robe or coat and knee-high boots. They would be seen together in parades and many New Year’s events. Post-Communist Russia In 1991 with the arrival of Glasnost and Perestroika the Russian people were once again free to celebrate Christmas. Russian Christians were once again able to worship without fear of persecution or death. The big celebration still occurs on New Year’s Day with extravagant fireworks and organized games. Grandfather Frost still delivers gifts on New Year’s Eve and is still accompanied by the Snow Maiden. The big feast still includes such foods as borscht, blini, sturgeon, halibut, or herring, fresh fruits and vegetables (when available), bread, and sweets such as baba or kissel. Without the fear of persecution many Russians are returning to church especially at Christmas and Easter. Christmas services in Russian Orthodox Churches are well-known for their sacred music, and many who cannot make it to the services are able to watch them on Russian television. Today’s Russian Christmas customs are still being developed. Some are trying to bring back some of the old customs while others are creating new traditions. Beat up eggs with sugar with the mixer until there is foam. Stir in flour very gradually and make dough very quickly. Fill in the form half (the dough will rise twice) with dough very very carefully. Grease the form abundantly with butter and sprinkle with flour. Close all windows and doors to avoid draughts otherwise “baba” will catch a cold”. Put in a warm place, don’t move it. As soon as the dough rise up to the top, bake in the oven (180C) until it is golden. It is very important to keep the form of “baba” after baking. Put upside “baba” in the form down on the paper until it is cold. Don’t take it out of the form until it is cold. Mix rum with cherry juice in a large bowl and sink “baba” in this syrup. Beat up yolks with cream and starch, pour in rum. Put the mass on a “steam bath” (put a smaller pan with cream mass in a large pan with water) and bring to thickening. Pour the sauce over “Baba” before serving. Christmas in Greece tends to be a religious celebration following the traditions and rites of the Greek Orthodox church. Preparation for the Christmas season begins on November 15 with a solemn forty-day period of fasting and reflection. This period called Christmas Lent lasts until Christmas Eve. People focus on preparing spiritually for the arrival of the Christ Child. They attend church services, confess their sins, and take Communion. They also fast abstaining from all meats, milk products, and rich foods. On Christmas Eve, the last day of Christmas Lent, groups of children go from house to house singing the Kalanda, Greek Christmas carols. It is considered good luck to have children come to one’s home and sing so often coins and treats are given to the children for their songs. The Kalanda are also sung on New Year’s Eve and the Eve of Epiphany, January 5. Decorations in the home are simple mainly involving the home’s altar. The altar consists of a wall cabinet or table where people stand or kneel and pray while facing the east. Religious icons, statues or pictures of saints, and other religious items are placed in or on the altar. The most popular icons picture Mary, Nicholas, and Basil. In addition to these icons family altars may contain wedding crowns, a cross, a prayer book, a censer, a light or candle, and other important items related to other religious holidays like Epiphany and Palm Sunday. Christmas trees did not appear in Greece until 1839 when King Othon I put one up in his court. It used to be that the tree of choice was the juniper tree decorated with walnuts, almonds, dried figs wrapped in tin foil and tied to branches with string, and tiny candles (lit only on Christmas Eve and Christmas Day). Today Christmas trees come from Greek tree farms and are decorated with lights and tinsel and topped with a star. Some homes put up the Christmas tree on Christmas Eve while others wait until New Year’s Eve. Greeks who own boats will decorate them in honor of St. Basil’s bringing presents from Caesarea by boat on New Year’s Eve. Children get into the act by decorating paper, tin, or wooden boats and placing them throughout the house. On Christmas Day the Dodecameron, the 12 days, begins. It is a joyful time of celebration that lasts from Christmas Day to Epiphany, January 6. For many this is a time of decorating, cooking, and buying and wrapping presents. Friends get together for parties, dances, and much fun and camaraderie. Christmas Day is the celebration of Christ’s birth. Many attend church services starting as early at 5:00 or 6:00 in the morning. Each home enjoys a Christmas feast shared with the immediate family only. Many families, as they gather around the table, will pause before sitting to lift the table three times in honor of God the Father, God the Son, and God the Holy Spirit. The meal starts with the breaking of the christopsomo, a Christmas bread eaten with honey. Roast pork, chicken, or rabbit may be found on the Greek Christmas table along with many delightful cakes, cookies, and pastries. Here are 2 recipes that one would find on many Greek Christmas tables. These Kourabiedes (Greek Butter Cookies) are a Greek classic. They’re buttery, crumbly, sweet, but not too sweet, and the perfect holiday treat! Preheat oven to 350 degrees. Beat butter in the bottom of a stand mixer on a medium-high speed for 20 minutes. Add egg and almond extract, mix until combined. Sift 8 tbsp. powdered sugar and baking soda together in a small bowl. Add to butter and egg. Beat another 10 minutes on a medium high speed. Sift five cups of flour and salt together in a large bowl. With the speed on low, add flour a little bit at a time until completely incorporated. If the dough is too sticky, add ½ cup more of flour. To Form: Roll about 2 tablespoons of dough into crescents and place on a baking sheet lined with parchment paper or silt pad. There is no need to place cookies very far apart, as they do not spread much. Bake for 15-20 minutes until very pale brown and cooked through. If serving cookies right away. Let them cool slightly and toss in powdered sugar. These will keep for 5 days. If you want to keep them for longer than five days, wait to toss in powdered sugar until just before serving. *These can be frozen for up to 3 months in an airtight container. 1. Preheat oven to 350 degrees F(175 degrees C). Butter the bottoms and sides of a 9×13 inch pan. 2. Chop nuts and toss with cinnamon. Set aside. Unroll phyllo dough. Cut whole stack in half to fit pan. Cover phyllo with a dampened cloth to keep from drying out as you work. Place two sheets of dough in pan, butter thoroughly. Repeat until you have 8 sheets layered. Sprinkle 2 – 3 tablespoons of nut mixture on top. Top with two sheets of dough, butter, nuts, layering as you go. The top layer should be about 6 – 8 sheets deep. 3. Using a sharp knife cut into diamond or square shapes all the way to the bottom of the pan. You may cut into 4 long rows the make diagonal cuts. Bake for about 50 minutes until baklava is golden and crisp. 4. Make sauce while baklava is baking. Boil sugar and water until sugar is melted. Add vanilla and honey. Simmer for about 20 minutes. 5. Remove baklava from oven and immediately spoon sauce over it. Let cool. Serve in cupcake papers. This freezes well. Leave it uncovered as it gets soggy if it is wrapped up. My friends at Tree Classics shared this History of Christmas Traditions with me so I thought I would share it with you. Thank you, Tree Classics! I bet there is something here that you did not know. Now I wonder what Michelangelo used to sculpt his snowman. For more Christmas tradition history visit Tree Classics’ blog. Please share some of your Christmas traditions in the comments below. T his year we experienced a special celebration at our house. It was my wife and my 25th anniversary. It made me stop and think about the 25 Christmases that we experienced as a family. Our first Christmas we did not have much money. We got a Christmas tree, a star to top it, lights, and some garland; but we did not have ornaments. My wife had some books with bead patterns for Christmas ornaments. We must have made several dozen ornaments, bells, stars, ball ornaments filled with figures. Many of these ornaments we still have and still put on our trees. A few years later we had some little ones to enjoy our Christmas trees. By this time we had some store-bought ornaments hanging from the branches. We also had a train running around the tree. Then came a major move from the Gulf states to the upper Midwest. We no longer had room for the train. The tall trees did not fit either. We started using a 4-foot tree set on an end table. The star and the bead ornaments were still there, and more children were enjoying Christmas with us. We finally bought a slim 6-foot tree and started decorating the tree with color-themes. Our favorites color themes are red and silver, blue and silver, and purple and silver. Many of our Christmas traditions were set during this time. Every year we set up our tree the day after Thanksgiving with all the children helping decorate. We usually take a Saturday in December to make several kinds of cookies. The family decides on 3 or 4 kinds of cookies to make. (At one time we let every child choose a cookie recipe to make on that day; but as more children arrived, cookie making day became a chore instead of being enjoyable so we cut down on the number of cookie choices.) Every Christmas morning we have a hashbrown breakfast casserole. Last year when my wife and I talked about doing something else for Christmas breakfast the children spoke up and made us know that they wanted the traditional hashbrown casserole. Unlike many families who have turkey with all the fixings for Christmas dinner, we have an extra-cheesy, extra meaty lasagna. It sure simplifies the clean up. Then came another move, not so far this time. Now we are able to comfortably set up two Christmas trees. We decorate one tree with a color-theme and the other with our favorite ornaments. The train has also reappeared. The next 25 years will be full of surprises. As the children grow and move on to make families of their own, I am sure we will be dropping some traditions and adding new ones. The trees will lose some ornaments and gain others. But, oh, the fun we will have getting there. heat for 5 minutes or until meat crumbles. is no longer pink and hash browns are lightly browned. 3. Drain mixture well on paper towels. 4. Spoon mixture into a lightly greased 13×9-inch baking dish. 5. A stoneware baking dish works really well. baking mix, salt, and pepper. 7. Pour evenly over sausage/hashbrown mixture. 9. Cover and chill for 8 hours. 10. Bake covered with foil at 350 degrees for 45 minutes. inserted in the middle comes out clean. 12. Remove from the oven and let stand for 5 minutes. by covering it with foil and putting it in a 200 degree oven. (picante, hot sauce). You can also garnish it with parsley. Christmas in Ireland, with all its religious overtones, is a time for family. The religious nature of an Irish Christmas begins with Advent. Starting four Sundays before Christmas Advent is a time to ponder the birth of Christ and get ready for the celebration of His birth. It is a time for confession of sins and for expressing sorrow for wrongdoing. One must be holy when expecting a holy Visitor. Much must be done to prepare for Christmas. Houses must have a thorough cleaning. The grounds and all out-buildings get a good tidying also. Christmas cards are sent to neighbors, friends, and family members. Most of these cards have religious themes but Santa Claus, reindeer, and snowy landscapes may also be seen. Christmas trees did not become a regular part of Christmas decorating until the 1960s. Some people put their trees up the first week of December while others wait until Christmas Eve. Electric lights, tinsel and a variety of purchased and homemade ornaments adorn each tree. Even churches get in the spirit of the season by decorating the pillars and the altar with garlands of holly leaves. A nativity scene is also part of every church’s display usually found near the altar, in the back of the church, or outside in front of the church. On Christmas Eve and Christmas Eve day final preparations are made for the Christmas celebration. As expected, unmarried children, no matter their age or how far away they live, arrive at their parents’ house. Most, if not all, Christmas shopping is done; but many shops stay open later than normal for those last-minute shoppers. The house fills with glorious odors as food preparation begins in earnest. The family goes through the house giving it a final tidying before the celebration begins. Some of the more religious families fast on Christmas Eve until dinner when a simple meal of fish and potatoes is served. Many families wait until Christmas Eve to put up their Christmas tree. Candles are placed in the windows. For many the Christmas season is about to begin, with the lighting of the candles. Traditionally the main candle is lit by either the youngest child in the family or a daughter named Mary. Some children hang their stockings before the family goes to Midnight Mass; others wait until after mass. After returning from mass the children go to bed. After the children fall asleep the parents place the children’s gifts under the tree or around the room often arranged in piles on chairs with the child’s name on the chair. Christmas morning children awaken and rush to see what Santa Claus has left for them. Most gifts are practical, but as Irish affluence increases the gifts become less practical. Some who did not go to Midnight Mass, and some who did, attend “First Light” Mass at either 6:00 AM or 8:00 AM. After mass the men and boys enjoy games of hurling (a game similar to field hockey), Gaelic football (a game like soccer), shooting competitions, and hunting rabbits with greyhounds. The women prepare the Christmas feast and deliver gift baskets to less fortunate neighbors filled with the ingredients for a “proper” Christmas dinner. The Christmas table is covered with a linen or lace tablecloth and set with the best china, polished silver, and cut-glass stemware. The traditional Christmas dinner may consists of roast goose or turkey (often served with ham) stuffed potatoes heavily seasoned with black pepper, mashed or roasted potatoes with gravy, and one or two vegetable dishes. Desserts may include Christmas cake, Christmas puddings such as bread pudding or plum pudding, mincemeat pies or tarts, sherry trifle, soda scones, fairy cake, and cookies. After the Christmas feast families stay home relaxing, talking, singing and playing musical instruments, and telling stories. Irish history was once passed from one generation to the next via stories told at family gatherings like Christmas. Therefore, it is not surprising that some of these stories are of family ancestry, the famine, Irish heroes and villains, the countryside, as well as the Nativity. For more information about the Irish Christmas season visit CustomsOfChristmas.com. This month we have a special treat. Guest author Renee Hopkins gives us some inexpensive Christmas decorating projects that we can start working on even now for this coming Christmas. They also will not take a lot of room if you are decorating a small apartment. Thank you, Renee, for these wonderful ideas. Christmas is a festive holiday filled with family, friends and celebration. Part of making this holiday so special is decorating your home in a way that makes your home feel welcoming, festive and fun. While you can certainly spend a fortune trying to achieve the right holiday look in your home, you don’t have to. With some simple tips, you can create a beautiful and inviting Christmas décor that you’re certain to feel proud of. The traditional pine Christmas tree is always a classic look, but today, creative and chic ideas are in and quickly taking its place. Create your own unique Christmas tree with a fold out ladder, a few boards (cut at different lengths) a small pot of green paint and green, red and white household items. Simply paint your boards green, and arrange them along the steps of the ladder (after the paint has dried). This will provide you with the triangular shape of a Christmas tree. Place your red, green and white household items on the shelves, and you have a uniquely decorated tree at little to no cost. Tired of the less appealing little novelty items you get inside your Christmas crackers every year? Why not make your own? You will need wrapping paper (the type of wrapping paper you use will determine how elegant or creative your Christmas crackers will be), cracker snaps, cardboard toilet paper inserts, small gifts, stickers and some ribbon. Cut the wrapping paper into a rectangle measuring about 30cm in length and 20 cm in width. Glue one cracker snap onto the paper, lengthwise, and place one toilet paper insert in the middle with the gift inside. You can also add a hand written joke. Place another two toilet paper inserts on each side of the middle one and roll the paper around all three. Join the two ends of the paper with a sticker. Twist the paper where the inserts meet, and remove the two outside toilet paper inserts. Tie ribbons around the twist to add flair and hold the twist in place. In the same way new and novel ideas are replacing the traditional Christmas tree, wreaths are taking on whole new look too. Take a piece of sturdy cardboard, and cut it into a ring in the desired size. Collect items from around the home or garden that can be glued to the ring to entirely cover the cardboard. Anything from bottle corks, to beads, buttons, seashells, seeds, burlap, gift bows, ribbon, fabric or traditional pine cones can be used to create a unique and stylish wreath. Start saving up those plastic milk containers, making sure to wash them out carefully. Use different color paints and cardboard cutouts to create a snowman, reindeer or even Santa Claus. Dangle a small handheld torch from a string tied to a piece of wood, and place it into the opening of the bottle so that the stick holds it in place. You now have a creative outdoor decoration that lights up from the inside. To truly have a chic and elegant Christmas this year, think outside the box, and get creative. Your friends and family will simply love how innovative you are and appreciate the effort you put into making this memorable holiday a spectacular one. Renee Hopkins runs an innovative and affordable home décor site. Visit http://chichomeaccents.com/ to find everything you need to make your rooms beautiful, comfortable and chic. It recently came to my attention how blessed my family and I are. I do not know why I did not particularly notice it before. I mean God has blessed us and is blessing us daily, but this year it finally hit me how blessed we are. Two years ago at this time I was out of a job. God blessed me with a job for Christmas. I had an hour and twenty minute commute. God blessed us with a house only fifteen minutes away from my job. Now the house we are staying in is being sold. God blessed us with another house more affordable than the last. What a blessing! We are a large family, my wife and I and our seven children. It takes a lot to feed everyone. We were blessed to have several organizations offer to bring food stuffs. One of them even brought presents for the family. What another blessing! God is so good to us. This year we are counting our blessings. Why not count your blessings this year. Whether you have a lot of presents under your Christmas tree or just a few, a lot of food on your table or just enough for those around it, count your blessings. You may find that you are blessed beyond your wildest dreams. On November 30 our family will begin our celebration of Advent. Advent for us is not just a countdown to Christmas. It is a time for us to prepare for the celebration of and to remember the birthday of Jesus. 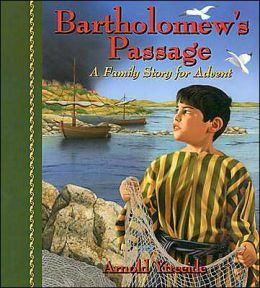 This year we are using a book written by Arnold Ytreeide called Bartholomew’s Passage. It is about a young Jewish boy and his adventures just prior to the birth of Jesus. This book is one of three interrelated books for Advent written by Mr. Ytreeide: Bartholomew’s Passage, Jotham’s Journey, and Tabitha’s Travels. Every night we read a portion of the story until, on Christmas morning, the story ends with the main character of the story arriving at the manger where the baby Jesus lays. This is an excellent way for the entire family to get into the Advent season. Even our youngest child sits quietly to find out what will happen to Bartholomew tonight. If you haven’t yet begun celebrating the Advent season or if you are looking for something new for Advent, why don’t you look for one of these books. You won’t regret it. Countdown to Christmas with CustomsOfChristmas.com’s Cinnamon Bear Advent Calendar. Taken from The Cinnamon Bear radio program the advent calendar follows the adventures of Paddy O’Cinnamon as he helps Jimmy and Judy find the silver star, stolen by Crazy Quilt Dragon, that belongs on top of their Christmas tree. The 26-segment story, each segment 12 – 15 minutes long, begins on Saturday, November 29, and continues through Christmas Eve. Join us and the Cinnamon Bear this Christmas season as we count down to Christmas. In a large mixing bowl, stir together powdered sugar, peanut butter, and butter until well combined. Shape into about 30 1-inch balls. Place balls on a baking sheet lined with wax paper. Let stand for about 25 minutes or until dry. Place water in the bottom of a double boiler to within ½ inch of upper pan. Make sure the upper pan does not touch the water. While balls are cooling and the water is heating, finely chop the chocolate so it will melt quickly. Bring the water to a boil. Remove from heat and place about ¼ of the chocolate in the top of the double boiler. Stir until melted. Add about ½ cup more, stir, and repeat until all chocolate is melted. Stir until chocolate has reached 120 degrees; reheat if necessary to reach this temperature. After the chocolate has reached 120 degrees, refill bottom of double boiler with cool water to within ½ inch of upper pan. Stir frequently until chocolate cools to 83 degrees. This should take about 30 minutes. Using a toothpick, dip balls in chocolate, working quickly and stirring chocolate frequently to keep it evenly heated. Place balls on cookie sheet. (Chocolate will stay close to 83 degrees for about 30 minutes. If temperature falls below 80 degrees, chocolate must be remelted.) Store tightly covered in a cool, dry place. Cut and Paste Day: Usually in mid-December family and friends gather for “Cut and Paste Day,” a day to make new handmade ornaments. Hearts, woven heart baskets, Danish flags, paper cones (to be filled with candies and nuts), three-dimensional stars, nisse (made with yarn) pine cone ornaments, little drums, and wooden figures are among the favorite handmade ornaments made on “Cut and Paste Day.” Most, if not all of these ornaments, will be red and/or white in color just like the Danish flag. Like children everywhere Danish children get excited with the anticipation of the Christmas celebration. So, when December 1 rolls around, out comes the advent candle and one or more advent calendars. Advent candles have marks on them one for each day of December leading up to Christmas. At some point each day, a family member lights the candle. The candle is allowed to burn to the next mark but no further until the candle is allowed to burn down to the final mark Christmas morning. Advent calendars may be homemade or store-bought, simple or elaborate. Some may have only windows to open revealing a verse or saying about Christmas. Others may include cookies, toys, small gifts, candles, candy, or gum for the child fortunate enough to expose the day’s goodies. A couple Danish television stations produce a special advent calendar in the form of a Christmas show that is divided into twenty-four episodes. These shows are like The Cinnamon Bear, Jonathon Thomas And His Christmas On The Moon, and Jump-Jump And The Ice Queen radio shows produced in the United States during the 1930’s and 1940’s. Christmas Seals: The purchasing of Christmas seals to raise money to treat children with tuberculosis began in Denmark. In 1903, Danish Postal clerk Einar Holboell looked at all the Christmas cards and mail going through the post office and thought what if people could purchase a Christmas “stamp” to place on their packages. He designed the first Christmas seal, had them printed, and sold them raising much money for the fight against tuberculosis thus beginning the beloved custom of purchasing Christmas seals. Norway and Sweden were the first countries to adopt this custom followed by the United States in 1907. Collectible Christmas plates: In 1895, the porcelain company Bing and Grondahl decided to make a special Christmas plate. It was to be colored blue and white, involving one of the more complicated processes in plate-making. On Christmas Eve the company made that plate a true collectible by destroying the mold. Every Christmas since then Bing and Grondahl has created limited edition Christmas plates breaking the molds for the plates on Christmas Eve. In 1908 Denmark’s oldest porcelain maker, Royal Copenhagen, started making its own Christmas plates following the same processes used by Bing and Grondahl. And like Bing and Grondahl, Royal Copenhagen breaks their molds on Christmas Eve. These plates have become the most sought after plates by plate collectors worldwide. Learn more about Denmark’s Customs of Christmas here. Here’s a Christmas cookie from Denmark. At a low heat, melt the butter (lard), sugar, and syrup. Add the other ingredients and mix well. Form the dough into rolls as if making refrigerator cookies. Store the rolled dough in the refrigerator for 2 to 3 weeks. Aging greatly improves the flavor. Cut the rolls into very thin cookies and decorate each with half of a blanched almond. Bake at 375 degrees F until the cookies are crisp (approximately 5 to 7 minutes). After cookies have cooled, store in a covered jar or tin.